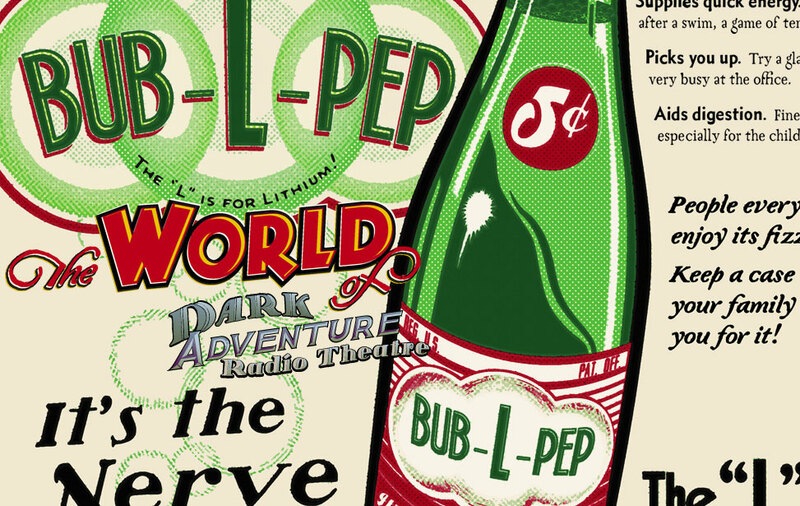 CHICAGO -- Popular "pulp" magazine Dark Adventure Mystery Stories is set to enter the world of wireless when it launches a new program, Dark Adventure Radio Theatre. 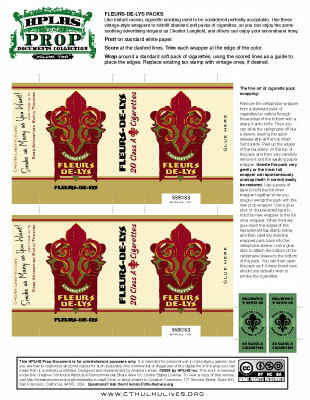 The Fleurs-de-Lys cigarette company will sponsor the show, which will be broadcast from coast to coast. Hosting the show will be well-known radio personality Chester Langfield. 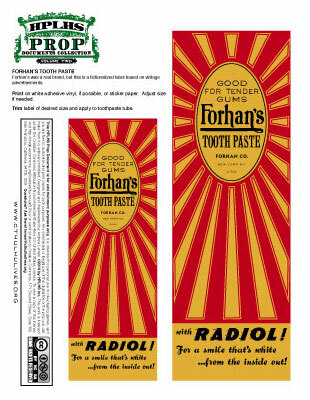 Radio lovers will remember him from his appearances on the Forhan's Toothpaste Hour of Smiles, airing Tuesday nights on the C.B.S. Langfield will introduce each episode of the new show and play occasional roles in the dramatized productions, it is said. "I cannot wait to share these thrilling and suspenseful stories with our radio audience", Langfield said, "Each episode is sure to be macabre journey that will leave you breathless." Each episode will be a dramatization of one of the stories appearing in the popular monthly publication. Dark Adventure, as it is known to its "fans," regularly features weird tales of horror, the occult, and fantastical fiction. Editor Warden Hale says that new stories, written just for radio production, will also be featured. In the parallel universe of the HPLHS, the one in which Lovecraft was rich and famous and beloved during his own lifetime, Dark Adventure Radio Theatre is a real thing. 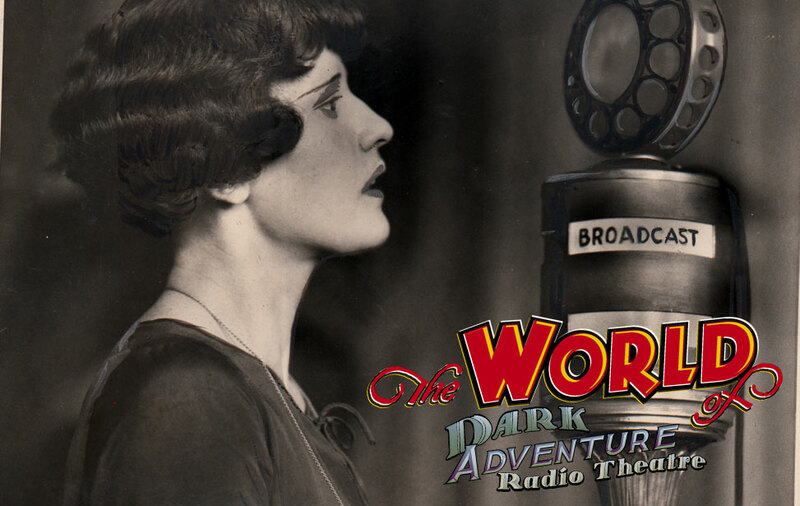 Join us here for a little trip into that alternate reality, and learn a bit about the hosts, the sponsors, and a bit of the backstory of Dark Adventure Radio Theatre itself. 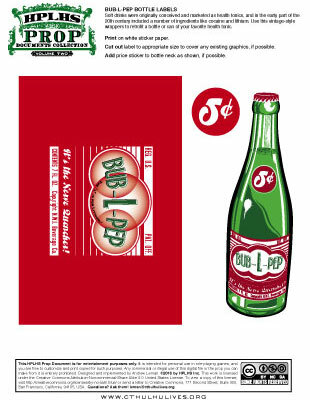 Be sure to scroll down the page for a number of PDFs you can download to make your own packs of Fleurs de Lys, your own bottles of Bub-L-Pep, and more! Although popular among young readers of "pulp" fiction, Dark Adventure is not without its detractors, who say its breathless stories corrupt the morals of the young and lead to a derangement of the nerves. A mysterious fire in the magazine's offices last year has been rumored to be the work of outraged citizens hoping to put it out of business. The fire destroyed back numbers and resulted in a temporary delay in publication, but the magazine has survived and is now preparing to take another step forward. 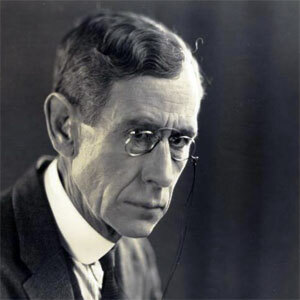 Editor Hale, a veteran of the Great War, is not easily daunted and figures he can tackle the radio business. He predicts a bright future for the enterprise. 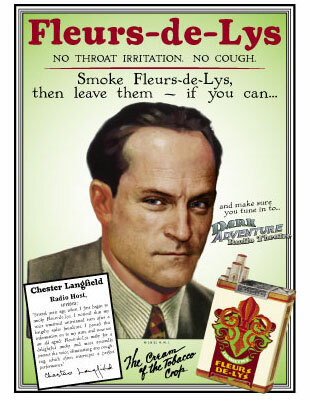 Luther Fairbairn, chief executive of Fleurs-de-Lys Tobacco, says the company is delighted to be sponsoring the new show. 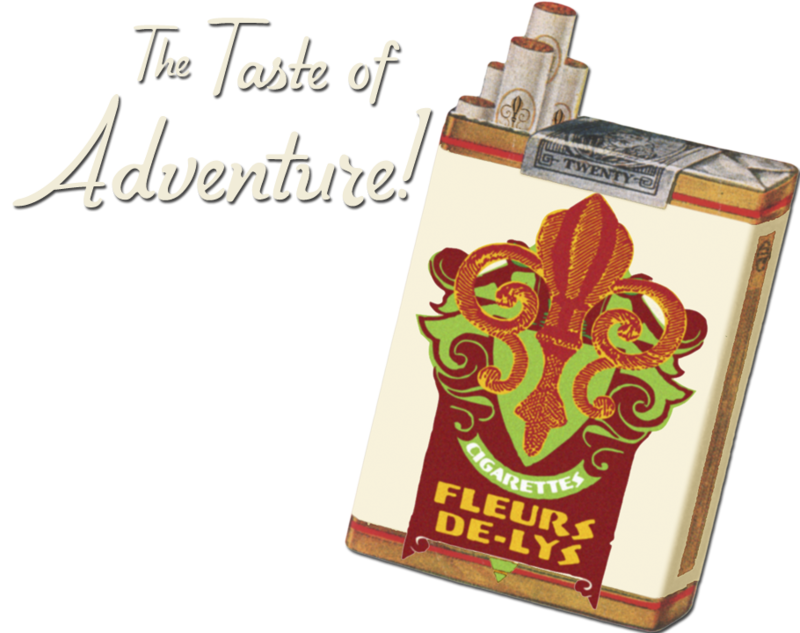 "The fellows who smoke Fleurs-de-Lys like rugged, manly adventure," he says, "just as much as they like the smooth taste of the finest cigarettes money can buy." Investors in the stock market seemed to take heart in the Fleurs-de-Lys sponsorship deal as New World Incorporated (NWI), the parent company of the Fleurs-de-Lys brand, ticked upward with the announcement. 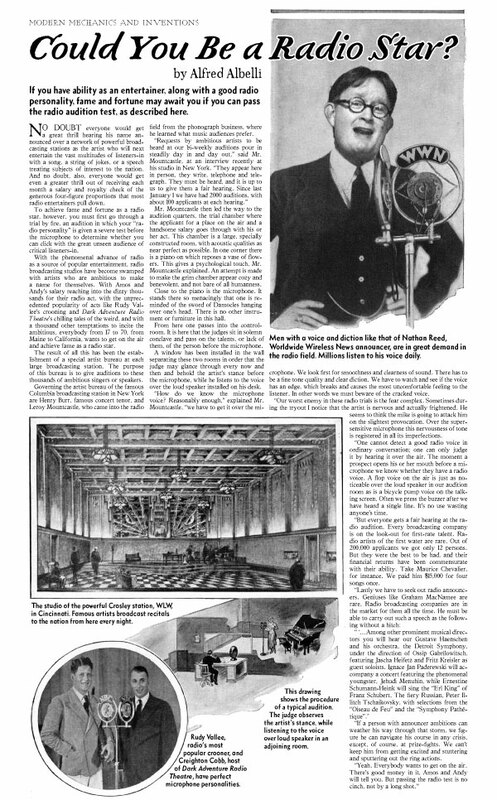 "Radio is a boon to mankind," said company president Edward Chandler, "and it's the future of popular entertainment. NWI always keeps its eye on the future." 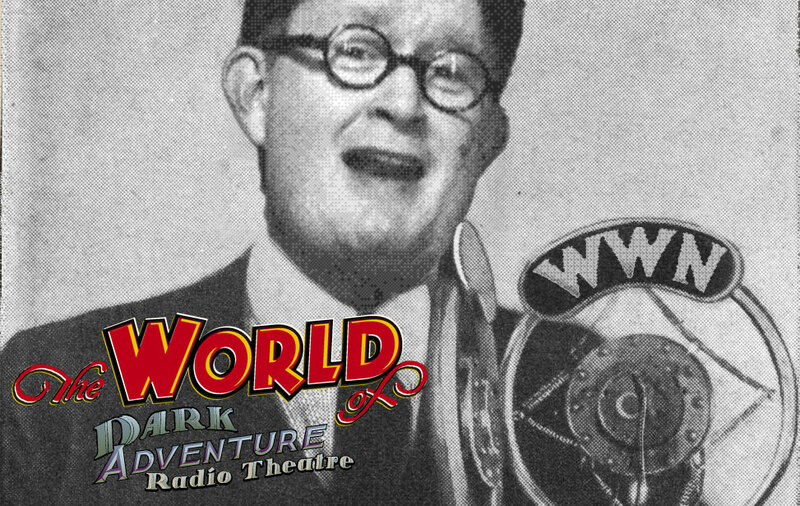 Dark Adventure Radio Theatre will follow in the footsteps of The Shadow and The Lone Ranger, two other radio shows based on the exploits of characters from pulp fiction. While those shows depend on one central character who recurs in each episode, Dark Adventure will take a different approach. "You might see a number of Nate Ward stories," said Editor Hale, referring to a popular character who appears in a series of tales from the magazine's pages, "but the show doesn't hang on any one figure." The characters who appear in the magazine's stories tend not to survive their encounters with the forces of darkness, Hale explained. 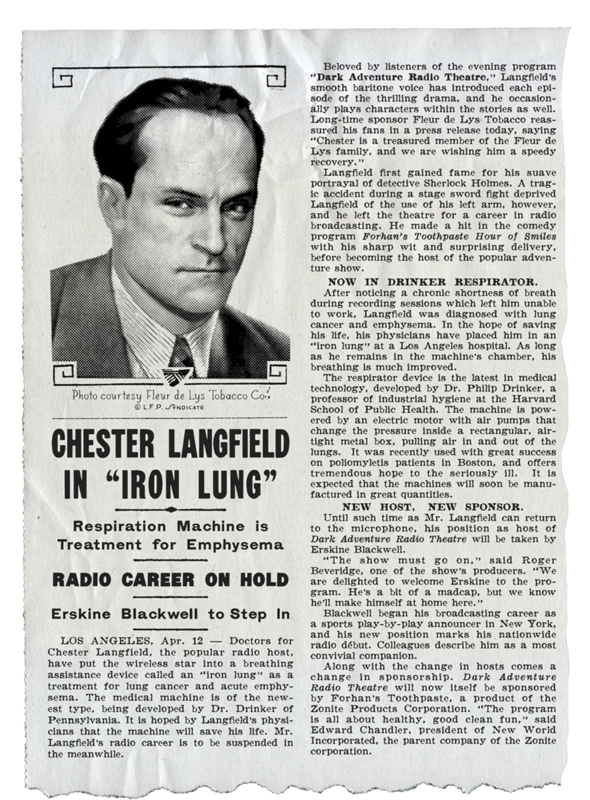 Classic radio shows and pulp magazines have long been intertwined. 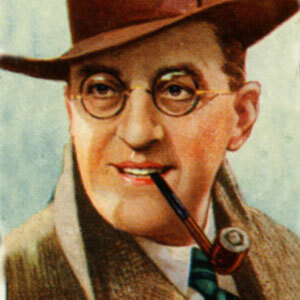 The Shadow, for example, was originally created as a generically spooky host for Street & Smith's Detective Story Hour radio show, which was itself produced to boost sales of Detective Story magazine. People enjoyed the host character so much that he was later made into the star of the show, got his own magazine, and became an icon of pop culture. 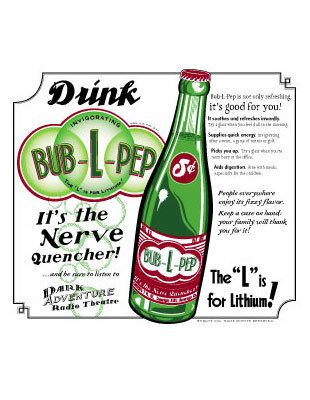 The magazine spawned the radio show, which spawned another magazine, which spawned another radio show, movies, comic books, and more. 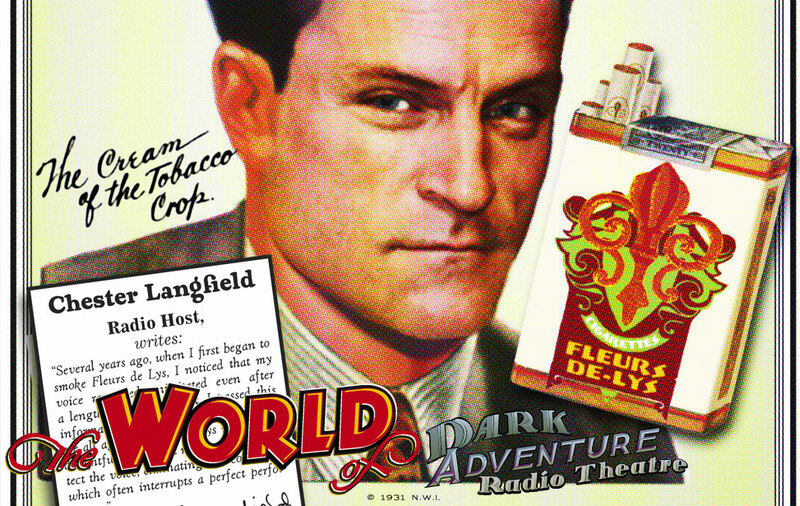 Dark Adventure Radio Theatre is similarly based on a magazine, Dark Adventure Mystery Stories. Coveted by collectors, Dark Adventure Mystery Stories magazine is one of the rarest of the classic pulps. 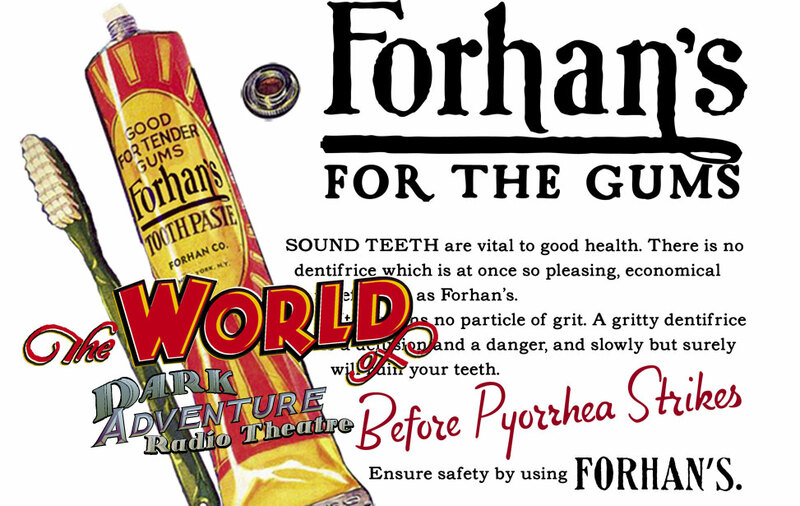 Published in Chicago from 1924 until about 1936, the magazine was edited by Warden Hale, a rival of Farnsworth Wright. Dark Adventure had a smaller circulation than Wright's more famous Weird Tales, but cultivated a similar readership. 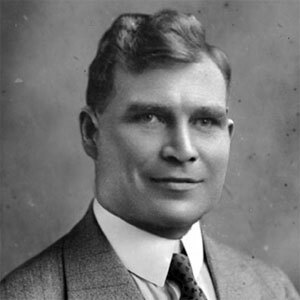 Authors such as Mason Farley and Charlie Tower, sometimes writing under pseudonyms, appeared in its pages, alongside John Styne, Rose Mackenberg (confidante of Harry Houdini), and Jack Carlton. Its offices were destroyed by fire some time in 1936, and Warden Hale dropped out of sight. No one is sure what became of him. He had been gassed in WWI and his health was never robust. A former Shakespearean stage actor, Langfield turned to radio when a tragic sword-fighting accident during a performance of Hamlet deprived him of the use of his left arm. 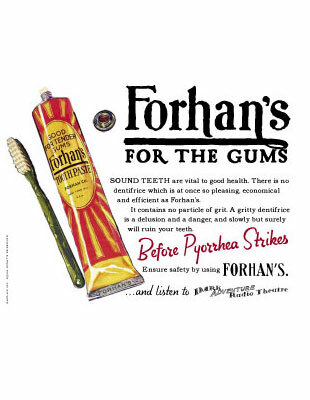 He made his radio debut on the Forhan's Toothpaste Hour of Smiles before becoming the host of Dark Adventure Radio Theatre. A former boxer, Blackwell began his radio career as a sports play-by-play announcer at WEAF in New York. Advertisers were quick to notice his rich voice and soon he was tapped to read commercial copy on the air. Known for his convivial lifestyle, Blackwell can often be seen in the nightclubs and dance halls of NYC. After a lengthy stage career playing villains in England, Mr. Dickens found a new and more congenial home in radio, where he could broaden his range. His one-man performance of "Nicholas Nickleby" will be Broadway's hottest ticket next season. 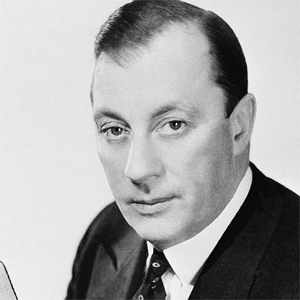 With his crisp diction and reputation for refined taste, Mr. Cobb has enjoyed a long and illustrious broadcasting career hosting cultural programs such as "Creighton Cobb's World of Classical Music" and "Let's Talk About Art." Mr. Mayhew has had a few adventures of his own, traveling the world and broadcasting from innumerable exotic locales. 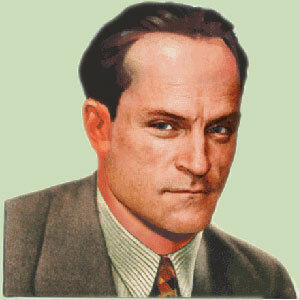 He was the first American to broadcast from atop the Great Wall of China. "Several years ago, when I first began to smoke Fleurs de Lys, I noticed that my voice remained unirritated even after a lengthy radio broadcast. I passed this information on to my stars and now we are all agreed. Fleurs de Lys make for a delightful smoke and most assuredly protect the voice, eliminating any coughing, which often interrupts a perfect performance." 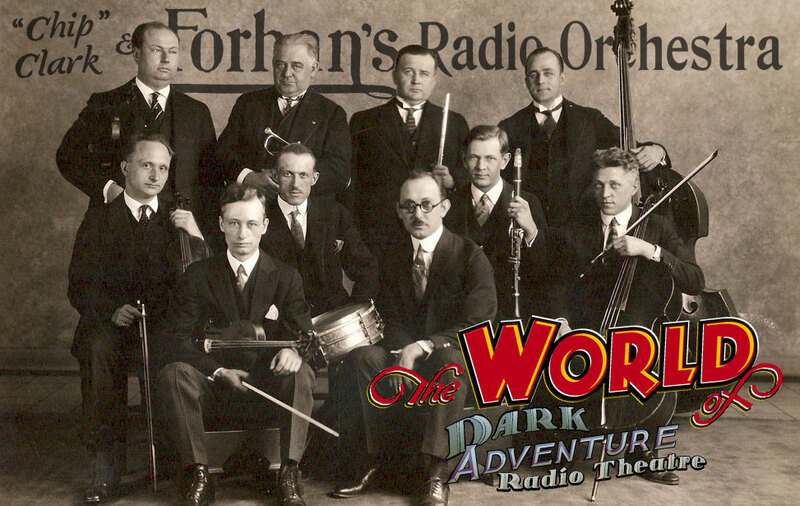 In the boxes below we are pleased to offer links to PDFs of ads from the various Dark Adventure Radio Theatre sponsors, prop package labels you can print at home, and other glimpses into the world of Dark Adventure. Simply click on the image above to view or download a PDF of "Could You Be a Radio Star?" Hover over any of the images below and click on the magnifying glass icons to view, or the link icons to download those PDFs.